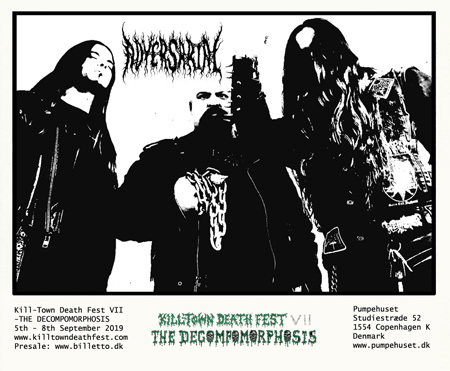 Killtown Death Fest » Announcement #19: Adversarial (can) one-off exclusive 2019 Euro gig!!! Announcement #19: Adversarial (can) one-off exclusive 2019 Euro gig!!! Turning our attention back now to Canada, we are pleased to welcome a band that has graced the European stage only once so far in their journey, and not yet on the mainland. More than three years since the release of their last album, it is certainly long overdue that we announce that ADVERSARIAL will join us at KTDF 2019! Formed 12 years ago, it wasn’t long after their 2008 demo that Adversarial joined forces with Dark Descent Records before releasing their 2010 debut LP ‘All Idols Fall Before the Hammer’. With fire and destruction as their impetus, the album was a powerful blast to the face of those who cast their bleeding ears upon it. Rejecting social groups and status, Adversarial channels the knowledge attained through a distancing from man and society into a malevolent assault fuelled by a hatred for such futile concepts. The band’s last album, 2015’s ‘Death, Endless Nothing and the Black Knife of Nihilism’, saw the band at their most fierce to date. Described by Cvlt Nation as “a tightly wound beast of destruction that is as dynamic as it is punishing”, Adversarial balances powerful aggression with songwriting prowess. Be prepared and expect no mercy as Adversarial brings their Nihilist Warcult Death Metal to the stage at Kill-Town Deathfest 2019.